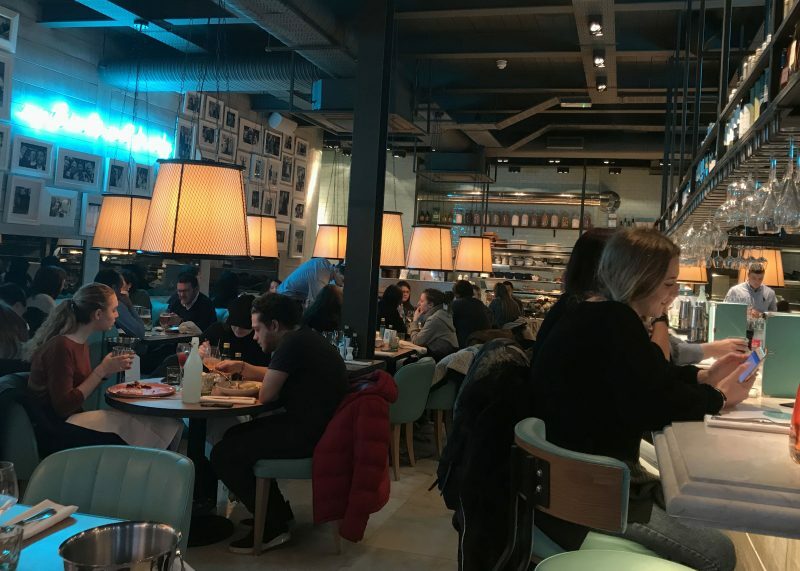 If you’re a fan of turquoise decor and Italian food, Gino D’Campo’s ‘My restaurant’ is the spot for you. Low hanging lamps do make for a slight head hazard but the gorgeous furniture, hundreds of black and white photos of Gino himself amongst the neon lights make up for that (oh and the food of course). This is made up of Gino’s fave recipes from his books, which means you can recreate your fave choices at home too! I’m looking forward to picking some recipes from my signed copy of “Italian escapes” (you can get the signed books for £10 in the restaurant, bargain!) He’s often at the Camden location and in fact we’d just missed him, as he’d been there the evening before Sarah and I had lunch haha! 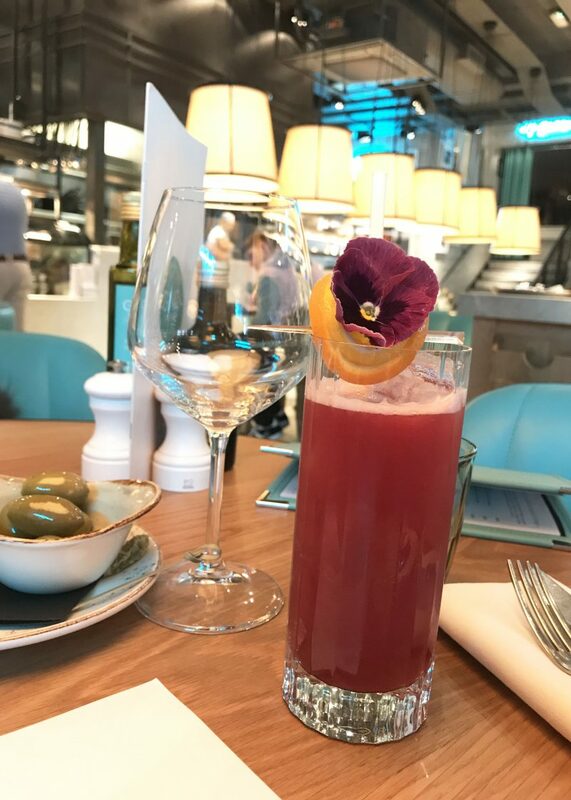 The staff were fabulous and friendly, very accommodating of my mocktail requirements (it was January) and had a proper GF menu for Sarah to pick from too. 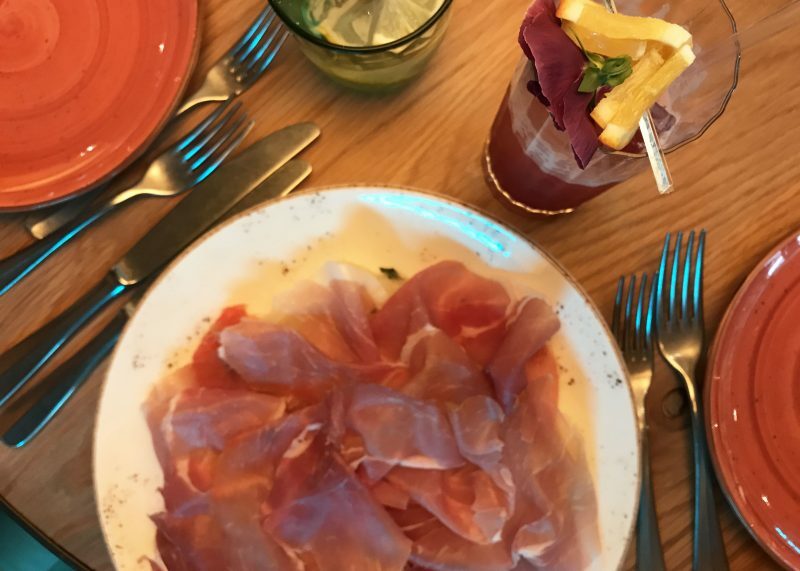 To start we shared the ‘Parma Ham & Melon’, which came with the sour flavour of grapefruit and a sprinkle of mint – a classic, light and tasty starter (anything with Spanish or Italian ham like that is amazing to be fair). For mains I had the lobster linguine – which took centre stage on my plate arriving in half a lobster shell. Lobster and I fell out last time we encountered each other around 3 years ago so it was good to get on good terms again (I will NOT go into details). My side of courgette fries balanced out the rich tomato dish perfectly, giving the pasta a little salty crunch (mmm). Sarah ordered the chicken escalope with rocket, veg and lentils on the side! 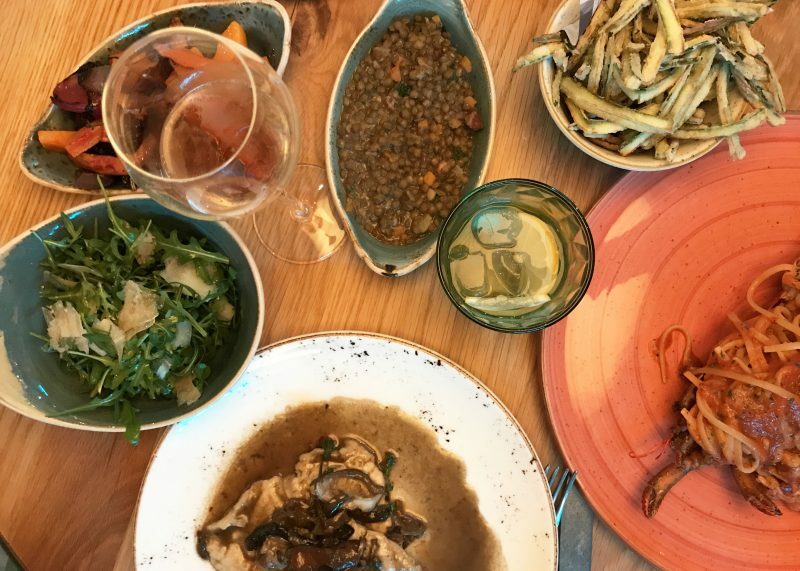 Gorgeous food – even the olives to start were good. The restaurant filled up around us, and by 1.30/2pm it was bustling and busy – plenty of Camden visitors taking shelter from the rain and grabbing a cheeky Italian. 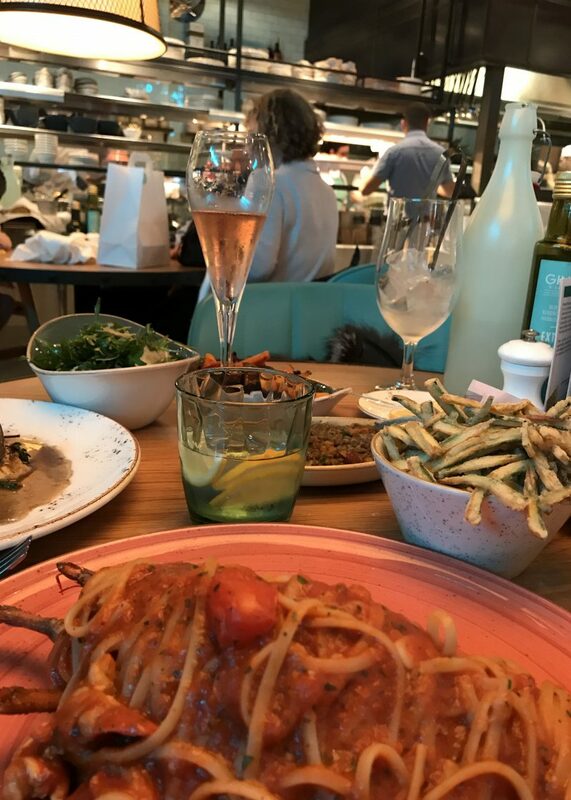 The prices for ‘My Restaurant’ were really reasonable, £10 or so for pasta and then slightly more for mains – you can check out the full menu on their website, and see the other locations. Upstairs at this venue there is a cute bar, pool table and tables, perfect for a private party! 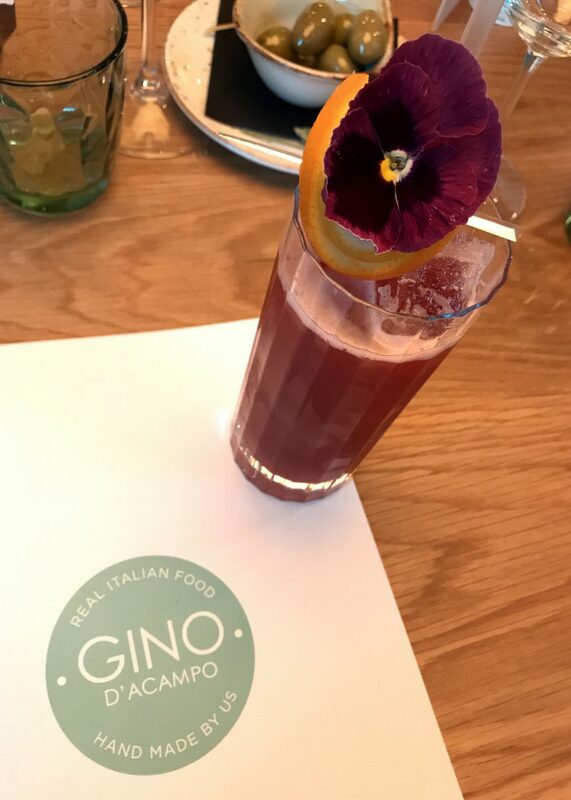 They are opening Gino’s all over the country, and many more to come, so get yourself there for some fantastico Italian food! Check out my other restaurant reviews here.